Earnings conference call and LIVE webcast for the fourth quarter and full year 2015 of VeriSign, Inc. (NASDAQ: VRSN): Thursday, Feb. 11, 2016, at 4:30 p.m. ET (prior to the earnings call, the earnings news release will be distributed via wire services at approximately 4:05 p.m. and also be available directly from the company's website at investor.verisign.com). Teleconference call , which will be accessible by direct dial at (888) 676-VRSN (U.S.) or (913) 312-1460 (international), conference ID: Verisign. An audio archive of the call will be available at investor.verisign.com/events.cfm. More info: investor.verisign.com. UPDATE: Earnings Press Release -- VeriSign Q4 EPS of $0.79 beats by $0.01. Revenue of $272.62M (+6.5% Y/Y) beats by $2.42M. 2016 guidance: revenue of $1.11B-$1.135B (+5-7% Y/Y) vs. a $1.14B consensus; operating margin expected to rise to 62.5%-63.5% from 2015's 61.5%. Noted during the call was the surge in Chinese .COM registrations in Q4 2015, and corresponding possible negative impact on Q4 2016 registrations (including renewals) anticipated. Also, ICANN and VeriSign are negotiating a 10-year Root Zone Maintainer contract which would run concurrently with a new 10-year extension of the current .COM registry agreement, with no material changes in pricing terms of dot COM domain names from the present agreement. This new agreement for Root Zone Maintainer and extension of the .COM registry agreement would require approval of NTIA, and the ICANN and VeriSign Boards of Directors. Finally, looking forward, it was noted that Verisign would consider acquiring some new gTLDs as the expected industry consolidation occurs (due in part to the disappointing registration numbers in new gTLDs). UPDATE: Verisign Conference Call transcript | Seeking Alpha: Verisign Chairman D. James Bidzos: "... we expect the first three quarters of the year to have roughly a similar pattern of quarterly net additions to the domain name base as we saw during 2015. However, we expect the fourth quarter of 2016 to be somewhat unique, as the expiring domain name base in that quarter will have the largest percentage of first-time renewing names that we've seen as a result of the strong Q4 2015 performance. While it's difficult to assess what the renewal characteristics of these new names will be due to the unusually large upcoming Q4 2016 expiring base, we expect fourth quarter deletions to be elevated. Accordingly, deletions could exceed additions in the fourth quarter of 2016. Based on these and other factors, we expect the first quarter 2016 net change to the domain name base to be an increase of between 1.5 million and 2 million names. 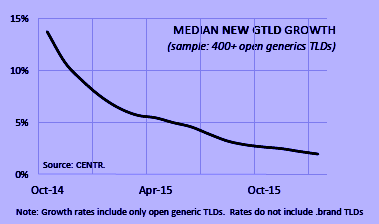 And we are forecasting the full-year 2016 domain name base growth rate to be between 0.5% and 2%. .... we're not actually changing the terms of the .com Registry Agreement. And this is not a renewal. This is an extension. We are negotiating entering into a 10-year contract with ICANN to perform commercial services as the Root Zone Maintainer ... we are discussing – the extension of the .com Registry Agreement for 10 years. So at that point, should all of these conditions that I described earlier, for example, approval of ICANN's Board of Directors and VeriSign's Board of Directors, no changes whatsoever can be made to the .com Registry Agreement without the consent of the NTIA ... Amendment 32 is a separate part of the Cooperative Agreement [which expires Nov.2018] that addresses pricing with respect to our ability to seek a price change [.COM] if we think it's justified by market conditions. So I certainly don't anticipate that that would change. That would remain. So VeriSign's right to seek relief from price controls based on market conditions that would warrant it would remain ... the new gTLD program could present some inorganic opportunities in our core business. And that's certainly still true. In fact, just recently, a group of observers of that marketplace, who are heavily involved in, all sort of opined that 2016 could be the year of consolidation in that business. And certainly those opportunities to acquire growth in our core business would be something we'd look at ..."
Verisign ended 2015 with cash, cash equivalents and marketable securities of $1.9 billion, an increase of $491 million as compared with year-end 2014. Cash flow from operations was $189 million for the fourth quarter of 2015 and $651 million for the full year 2015 compared with $170 million for the same quarter in 2014 and $601 million for the full year 2014. Deferred revenues on Dec. 31, 2015, totaled $961 million, an increase of $71 million from year-end 2014. Capital expenditures were $12 million in the fourth quarter and $41 million for the full year 2015. During the fourth quarter, Verisign repurchased 1.8 million shares of its common stock for $150 million. 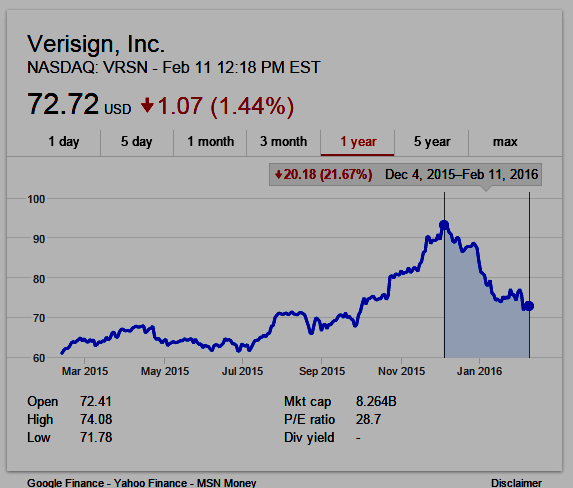 During the full year 2015, Verisignrepurchased 9.3 million shares of its common stock for $622 million. Effective Feb. 11, 2016, the Board of Directors approved an additional authorization for share repurchases of approximately $611 million of common stock, which brings the total amount to $1 billion authorized and available under Verisign's share buyback program, which has no expiration. For purposes of calculating diluted EPS, the fourth quarter diluted share count included 21.4 million shares related to subordinated convertible debentures, compared with 14.7 million shares for the same quarter in 2014. These represent diluted shares and not shares that have been issued. 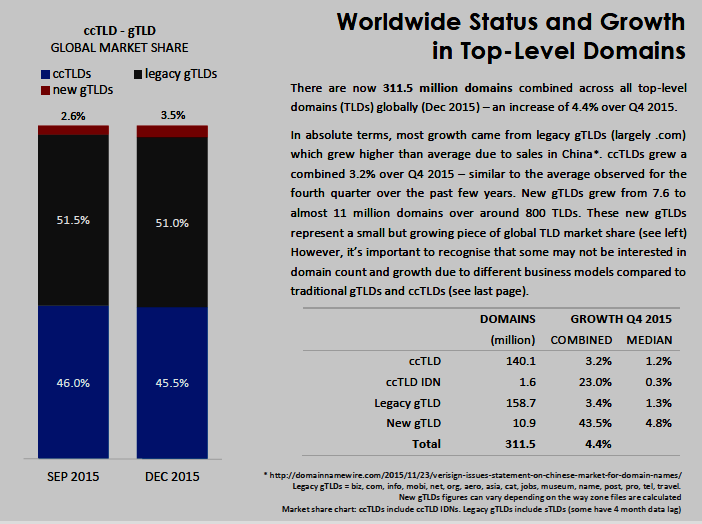 Verisign Registry Services added 4.6 million net new names during the fourth quarter, ending with 139.8 million .com and .net domain names in the domain name base, which represents a 6.3 percent increase over the base at the end of the fourth quarter in 2014, as calculated including domain names on hold for both periods. In the fourth quarter, Verisign processed 12.2 million new domain name registrations for .com and .net, as compared to 8.2 million for the same quarter in 2014. The final .com and .net renewal rate for the third quarter of 2015 was 71.9 percent compared with 72.0 percent for the same quarter in 2014. Renewal rates are not fully measurable until 45 days after the end of the quarter. Verisign (verisign.com) is a global leader in domain names as registry operator of .COM and .NET top-level domains, provider of registry services and internet security, and also serving as the world's internet root zone maintainer under a cooperative agreement with the U.S. government. 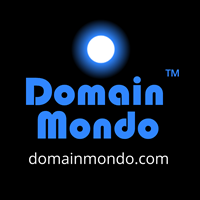 The active zone as of 02/11/2016 contains 124,038,522 .com domain names and 15,602,017 .net domains totaling 139,640,539 domain names. Note the Schedule 13G filed with the SEC on February 10, 2016, disclosing Blackrock (domain: blackrock.com) increased its ownership to 5.8% of the outstanding shares of Verisign. Warren Buffett's Berkshire Hathaway (domain: berkshirehathaway.com) is also one of the largest stockholders in Verisign, owning 12,985,000 shares, or 11.46% of VRSN. About Verisign: "Verisign, a global leader in domain names and Internet security, enables Internet navigation for many of the world's most recognized domain names and provides protection for websites and enterprises around the world. Verisign ensures the security, stability and resiliency of key Internet infrastructure and services, including the .com and .net domains and two of the Internet's root servers, as well as performs the root-zone maintainer functions for the core of the Internet's Domain Name System (DNS). Verisign's Security Services include intelligence-driven Distributed Denial of Service Protection, iDefense Security Intelligence and Managed DNS." (Source: Verisign.com).